The Robot Restaurant in Tokyo is located in the Kabukicho (read: gentlemen’s entertainment) district in Shinjuku, Tokyo. 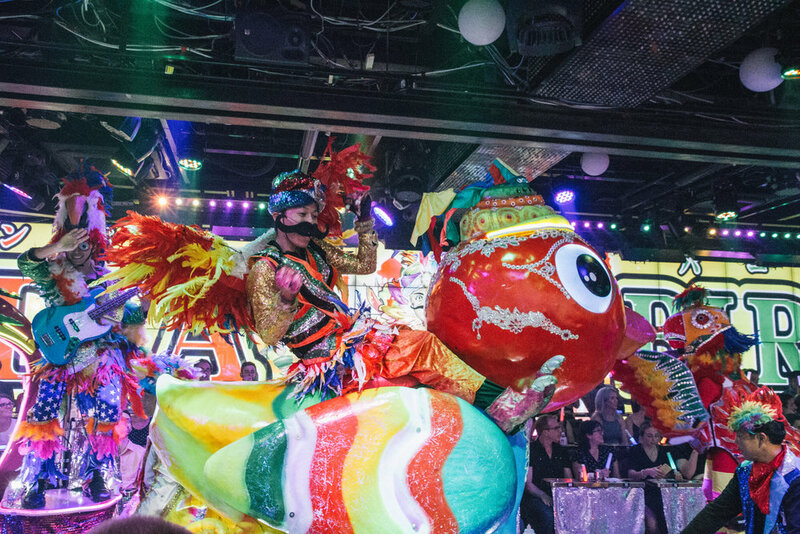 Even though the Robot Restaurant is called a “restaurant,” people don’t really eat in there. Visitors are interested in the robot fights, seizure-inducing blinking neon lights, and girls who look like they walked out from a manga. If you’re interested in this one-of-a-kind experience the next time you’re in Japan, read on! Shinjuku is where I always stay when I visit Tokyo. It’s the biggest transportation hub in Tokyo (even beating out the Tokyo Station itself), and there are several mega malls linked to the Shinjuku Station so I could never, ever be bored. Sometimes when hunting down food, I would find myself in the Kabukicho area. Even though it’s technically the red light district, it is perfectly safe to walk around. This is Japan after all! It’s hard to miss the Robot Restaurant door sign when you’re in the area. You’ll surely be blinded by all the flashing lights at the entrance (and get attracted by the scantily-dressed female robots). 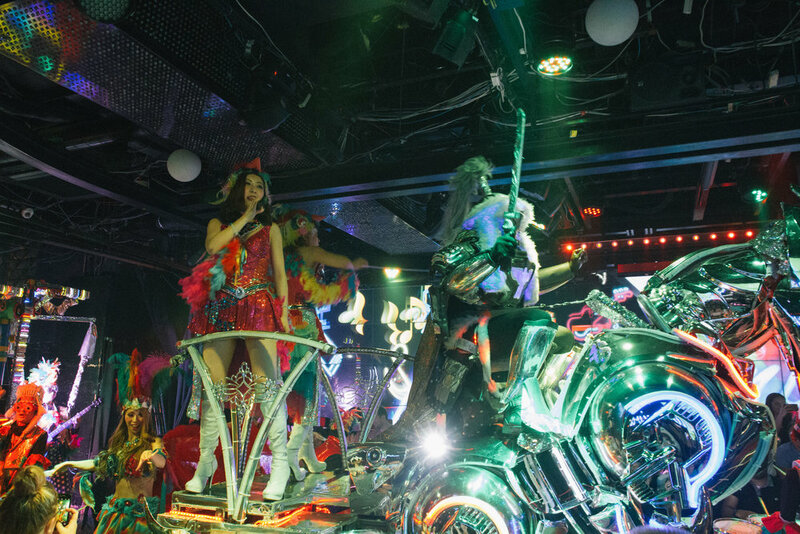 I was hesitant to go to the Robot Restaurant at first since it’s very touristy (it’s ranked #1 on Trip Advisor). It’s so touristy that when I mentioned it to my Japanese friend, she had no idea what I was talking about. Buuuut John was so fixated on the word “robot” and the idea of watching a robot fight live, that in the end, I caved and we booked the tickets to see the show. Two words: visual overwhelm. From the moving robot seats at the entrance to the 3D floral walls mixed with flashing neon lights……the impact on your eyes and mind is nothing but shocking. Oh, let me not forget to mention the stairs lined with posters of the Japanese dancers. I heard that it costs 10 billion yen ($90 million USD) to build this place. I guess that’s how much it costs to build a robot fantasyland in the middle of Tokyo’s most bustling area. If you are at the show early, you can spend some time at the flamboyant lobby/bar area to take pictures and sip on drinks. Without giving too much away (in case you want to see it for yourself one day), here’s a summary of the Robot Restaurant experience. First, you don’t really eat at the restaurant. You could, but I deduced the food here wouldn't be better than the food you could get outside. So I say skip the food and just enjoy the experience as it is – a show of robots, dancers, lights, and upbeat music. The show is divided into three sections with intermissions in between when they sell food and merchandises. I actually enjoyed the dancing and Japanese techno music part of the show more than the actual robot fights, since the robots don't actually come in contact with one another. So here’s my verdict, if you have some extra hours at night in Tokyo – GO. Yes, it’s touristy, but it’s worth doing once! I recommend going to the last show (9 pm) so you wrap up the night in a hyper note, while it doesn’t take time away from sightseeing during the day. NEWoMan: This it the new mall that just opened last year. Every floor has a different theme and caters to a different clothing style. Only women’s wear in here! The décor is so beautiful. I love it almost as much as GinzaSix! Shinjuku Gyoen: Originally the royal residence of the Naito clan in the Edo period, Shinjuky Gyoen is now a national garden. The décor is a blend of French, British and Japanese. This is also a great place to look at sakura blossoms during the right season! Donkihote: The best chain drug/beauty store! Even though this chain is all over Japan, the two locations at Shinjuku are decently sized (3 or 4 floors each), so check them out! 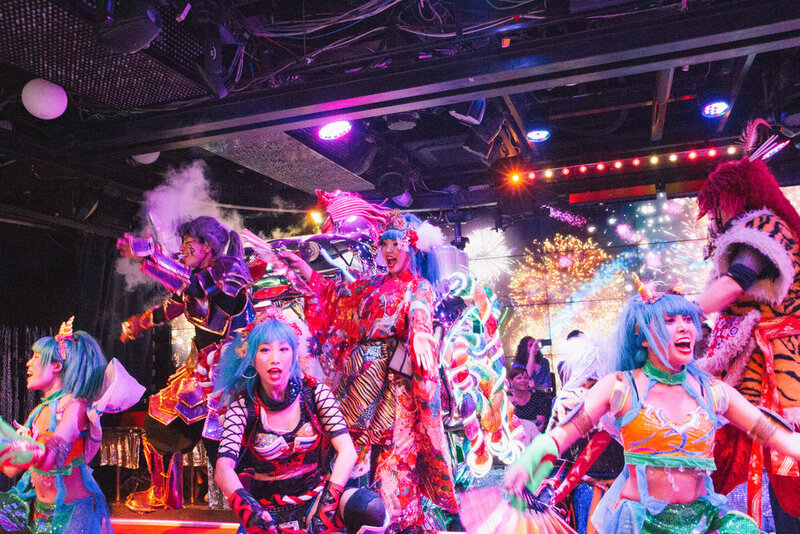 Kabukicho: As mentioned before, there are more at the Kabukicho than the Robot Restaurant! Eat some tapas and have some sake at the izakayas (Japanese bars), play some pachiko (game machines with metal balls), and shop at more drug/beauty stores. Be as funky and stylish as you want! This is the time when you can go crazy with your style! Reservations: Trust me on this, don’t pay the full price at the door. There are plenty of travel-related websites online that sell tickets for cheap. I got my ticket at Voyagin for 36% off plus a free popcorn! Should you sit first row or elsewhere? This is a question I really debated hard on. First world problems, I know. I wanted to take nice pictures so I do want to be close to the stage, but I also don’t want to be so close that I’m staring into the eyes of the robots and nothing else. The staff actually sets up chains in front of the first row just in case the robot runs your head over. You’re also advised not to leave any drinks on the tabletop. So you get how close you are to the robots in that case. So if you want to be up close and personal with the robots and cute dancers, pay extra to sit on the first row. If you want to get a good photo (like I do), take seats towards the back. Thank you! Don't forget to confirm subscription in your mailbox.